Parking just got a little tougher for students at the University of Cincinnati. Traffic Engineers from the City’s Department of Transportation & Engineering (DOTE) have now eliminated on-street parking during rush hour commutes along Martin Luther King Drive heading between Woodside Drive (entrance to Burnett Woods) and Clifton Avenue (map). Martin Luther King Drive between Woodside & Jefferson removed on-street parking completely when the street was repaved [LEFT]. Martin Luther King Drive between Woodside & Clifton now has rush hour on-street parking restrictions [RIGHT]. Photography by Jake Mecklenborg. 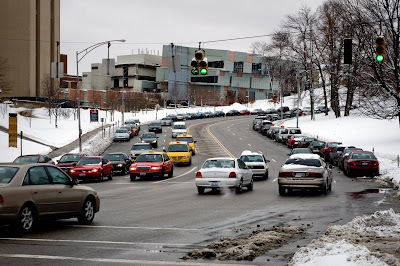 The westbound stretch of roadway has been precariously without parking meters and is one of the most sought after off-campus parking locations for students at UC’s College of Business and College of Design, Architecture, Art & Planning. While the eastbound side does have parking meters, the rates are extraordinarily low and are not on pace with nearby parking rates on-campus, in Burnett Woods, on other off-campus streets or garages. 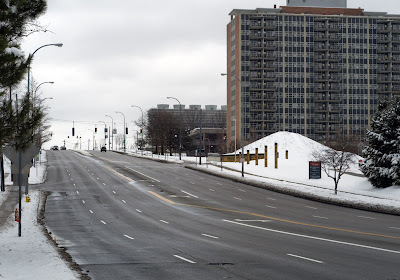 The move comes after the City completely removed on-street parking from the both directions of MLK Drive between Woodside Drive and Jefferson Avenue, and is seemingly part of the larger effort to grow MLK Drive to a much more auto-oriented street than is currently present. DOTE officials state that the new parking regulations are intended to “improve traffic flow” and “reduce traffic accidents” along the six-lane stretch of roadway. The new regulations prohibit parking eastbound on MLK Drive Monday through Friday from 6am to 9am and westbound from 3pm to 6pm.